This month's layout for my 2012 Photos I Love album is a little different than the previous months. You might recall that I am using square punched pieces as a border on these 8x8 layouts. The square punched pieces represent papers I have used in layouts throughout the month, however I only created a few layouts in August. This left me with only a few squares, so I added some stamping in the empty spaces to complete the border. Journaling reads: August means pre-season football at our house as we root for the Cleveland Browns and the Dallas Cowboys and await the start of regular season games (& cooler weather!). Yes, that is a delicious cake in the traditional Cleveland Browns colors! I think next time Robbie should make the cake in the Dallas Cowboys colors, don't you? I like the addition of the stamping very much! I think this is a terrific idea - it takes rounding up the month to a whole new scrapbooking level! The cake looks good enough to eat! Great layout even though I am not a sports fan either. Oh, I do love NASCAR but I don't think that's a sport. Love the Cleveland Browns cake! You must be pretty happy after that Cowboys victory! It's football season around here to but we are Black & Gold - Steelers all the way!! Love the page and great idea to use your stamps to fill in the empty spaces. 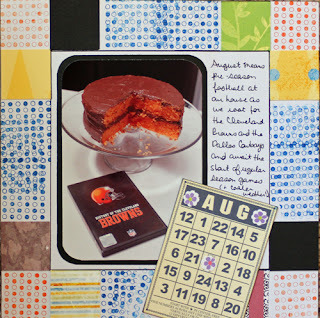 I love the idea of using the square punch pieces of pp you've used in the month! Great way to use up scraps! I'm loving all the dots and fewer patterns - well done adapting to what you have!